Sponsor: Carmichael Lynch Spong is one of the most decorated public relations firms in the world. Headquartered in Minneapolis, it is the 2004 and 2005 recipient of "Midsize Agency of the Year" by national trade journals The Holmes Report and PRWeek, respectively. The full-service firm ignites and sustains momentum for a select portfolio of blue-chip clients. Sponsor: Cramer-Krasselt offers strategically innovative communications to national consumer and corporate companies. Ranked among the top independent PR firms in the country by PRWeek, the firm employs its “Strategy Amplified” process to leverage PR capabilities and complete in-house integrated resources, including brand planning, creative design, Web, and new media to build brands. • Ogilvy PR Worldwide and The National Women's Health Research Center: What's Going on Down There? Sponsor: MultiVu, a PR Newswire company, provides unsurpassed broadcast television, radio, and multimedia production and global distribution services to organizations that want to reach the media, financial community, general public, and other key audiences with their visual and audio messages. • Fleishman-Hillard and Papa John's International: Papa, What's Next? Text! Sponsor: Deloitte LLP is the US member firm of Deloitte Touche Tohmatsu. Its subsidiaries provide audit, tax, consulting, and financial advisory services through nearly 45,000 people in the US. Known as an employer of choice for innovative human resources programs, it is dedicated to helping its clients and people excel. Sponsor: FedEx provides customers and businesses worldwide with transportation, e-commerce, and business services. Consistently ranked among the world's most admired and trusted employers, FedEx inspires its more than 290,000 employees and contractors to remain “absolutely, positively” focused on safety, the highest ethical and professional standards, and the needs of their customers and communities. For more, visit news.fedex.com. • Oasis and Honeywell: FMA Live! Sponsor: For more than 50 years, GolinHarris has provided unequalled expertise and resources to every client, creating programs to increase awareness of their missions, appreciation for their brands, enthusiasm for their products, and trust in their reputations. We are proud of the commitment and passion our people have to deliver results. Sponsor: PR Newswire Association (prnewswire.com) provides electronic distribution, targeting, measurement, and broadcast services on behalf of tens of thousands of corporate, government, association, labor, nonprofit, and other customers worldwide. Using PR Newswire, these organizations reach a variety of critical audiences including the news media, the investment community, government decision-makers, and the general public with up-to-the-minute, full-text news developments. Sponsor: Qorvis Communications is one of the nation's largest independent communications firms. Formed in August 2000, Qorvis provides in-house expertise in the areas of advertising, public and media relations, public affairs, marketing communications, internet campaigns and interactive design, social media strategies, grassroots programs, investor and financial communications, and research and opinion surveys. Sponsor: Text 100's consultants offer global industry expertise and specialized local knowledge across 31 offices in 21 countries. Its practices span every technology sector and key disciplines such as Clean Technology, Corporate Social Responsibility, and Peer Media. Text 100 represents innovative leaders including Cisco, eBay, Fujifilm, IBM, Lenovo, MTV, and Xerox. Sponsor: Ogilvy Public Relations Worldwide is a full-service agency operating in more than 60 markets worldwide. The firm provides corporations, government agencies, trade associations, and nonprofits with strategic planning and implementation across an array of disciplines, including PR, digital communications, influencer management, and more. Sponsor: TV Access was created to increase the well-being of the general public through effective public service communications. Communicators have great power and great responsibility. Whether your interest is corporate or cause-related, we prepare you to use your talents to make a difference in the world through ethical and responsible communications. Be inspired by industry leaders and a curriculum that focuses on strategy, digital, and integration, all with a global perspective. Sponsor: Cohn & Wolfe is a strategic PR agency dedicated to creating, building, and protecting the world's most admired brands. With offices around the world, the agency is committed to breaking new ground in the delivery of cross-channel media strategies, creative programming, and practice area excellence. Sponsor: Weber Shandwick is a leading global PR agency with a commitment to client service, creativity, collaboration, and harnessing the power of Advocates. It provides strategic execution in consumer marketing, healthcare, technology, public affairs, corporate/financial, and crisis management. Specialized services include social media, advertising, market research, and corporate responsibility. • Red Consultancy and McAfee: How Do You Get a News Anchor to Say Brad Pitt and McAfee in the Same Sentence? Sponsor: Founded in 1953, Burson-Marsteller is a leading global PR and communications firm whose knowledge, insights, and innovative programs help drive strong corporate and brand reputations for its clients. We provide our clients with strategic thinking and program execution across a complete range of public relations, public affairs, advertising, and other communications services. Sponsor: Coyne Public Relations has been shortlisted for PRWeek's Agency of the Year for five of the last seven years for its outstanding consumer and business-to-business creative approach to communications. The firm continues to grow in double digits, while maintaining itself as one of the best agencies to work for in America, boasting a 97 percent employee retention rate. Sponsor: Edelman is the world's largest independent public relations firm, with 3,200 employees in 54 offices worldwide. Edelman was named “Large Agency of the Year” in 2008 and 2006 by PRWeek and was the only PR firm in Advertising Age's “2007 Agency A-List.” CEO Richard Edelman was honored as “2007 Agency Executive of the Year” by Advertising Age. For more information, visit www.edelman.com. Sponsor: Kwittken & Company is an elite communications agency that provides its clients with results that extend far beyond traditional PR. We work with brands in the media/publishing, travel, luxury, fashion/retail, design, healthcare, financial services, technology, and b-to-b sectors to help them realize their business goals through intelligently designed, results-oriented campaigns. Sponsor: Padilla Speer Beardsley is a full-service communications firm with headquarters in Minneapolis and an office in New York. Our 110 employee-owners offer expertise in marketing communications, investor and corporate relations, employee communications, crisis management, new media, market and opinion research, and interactive and graphic design. The firm is a founding partner of the Worldcom Public Relations Group. Online at www.psbpr.com. Sponsor: One of the world's leading full-service, global PR agencies, Ketchum delivers innovations that help clients across all industries quickly realize their communications goals. 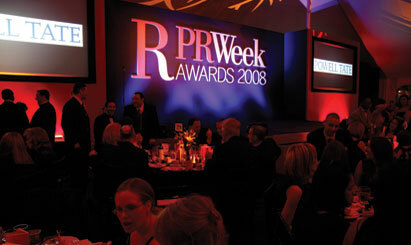 As a sponsor of the PRWeek Awards, we congratulate all the finalists. Sponsor: Fleishman-Hillard started in a tiny office upstairs from a dime store. We know firsthand the challenges of successfully operating a small agency. No matter how large we've grown, we're still committed to the principles that sustained us in the beginning. Respect the individual. Passion for client service. Uncompromising standards of integrity and quality. Thoughtful, creative work that makes a real difference. Congratulations to the Small Agency of the Year finalists. Sponsor: Euro RSCG Worldwide is a preferred destination for clients looking for fresh, considered communications that deliver a measurable difference and help them achieve their defined business targets. Our approach to creating outstanding, modern, creative campaigns for brands combines senior level attention and counsel with the reaction time and flexibility of a mid-sized firm. By influencing the influencers, our campaigns shape opinions, change behaviors, drive action and yield optimal results among our clients' audiences and stakeholders. The ERWWPR offering includes strategic and practical services in the arenas of consumer and buzz marketing, health and well-being, business-to-business communications, technology, multicultural communications and corporate communications. Candidates are the respective winners of the Boutique, Small, Midsize, and Large Agency of the Year awards, to be announced at the March 5 ceremony. Sponsor: NYU School of Continuing Professional Studies offers a Master of Science in Public Relations and Corporate Communications. This advanced degree provides a curriculum that is a thorough, leading-edge combination of theory and practice immediately applicable to your work environment. The faculty comprises industry professionals who bring unparalleled insight and understanding to their classrooms. Candidates are the winners of the campaign awards, to be announced at the March 5 ceremony. The shortlisted students for this award will be selected by a separate judging panel in late January. Sponsor: Hill & Knowlton is a leading, global, multi-specialist communications consultancy. We combine experience from all sectors and services to face the toughest communications challenges head on and to bring world-class counsel to local opportunities. We work with ease and impact at the intersection of business, policy, and communications.